A prime advertising market — well educated and discerning with time and disposable income at their command! Target the population of mid-Missouri who “go out” for their entertainment, who enjoy many of the finer things in life; automobiles, furnishings, electronics, etc. and also enjoy dining out, travel and other leisure activities. 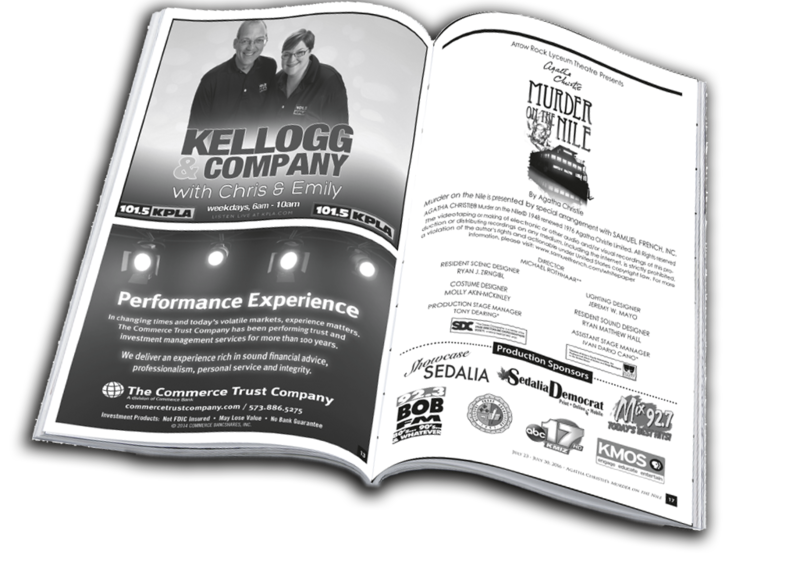 Let one of Missouri’s oldest professional regional theatre introduce your business to our loyal, dedicated and growing patrons in the Arrow Rock Lyceum Theatre Playbills. Reach mid-Missouri’s most desirable decision-makers in a well-read publication. Our playbills are read and kept by a performing arts audience with disposable income who come throughout the year for the best in professional theatre. This is a solid marketing opportunity that also demonstrates your support of the performing arts! Your advertisement will be seen by Lyceum Theatre patrons for an average run of 2 weeks for each edition, with up to eight performances per week. Don’t miss out on gaining valuable business exposure to thousands of patrons coming to The Lyceum.